Assistant Professor in Sociology, Faculty of Economics and Researcher at Center for Social Studies, University of Coimbra. Lectures in the masters in Society, Innovation and Entrepreneurship. Co-coordinator of the Post-graduation in Social Economy at the Faculty of Economics. Holds a PhD in Sociology from Lancaster University (UK), degree and masters in Sociology from the Faculty of Economics of University of Coimbra (FEUC). 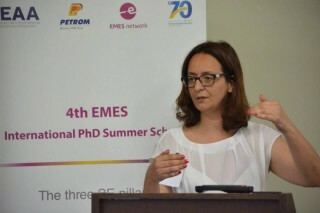 Currently assistant professor in Sociology at FEUC, where she works since 2002. Researcher at the Centre for Social Studies (in the research group on Social Policy, Work and Inequalities) and at the Center for Cooperative and Social Economy Studies of the Faculty of Economics. From 1996 to 2001 she worked as research Assistant at the Center for Social Studies, namely in the project Reinventing Social Emancipation among others. Lectures at undergraduate and at graduate levels in the Sociology and Economics degrees, master in Sociology, master in Society, Innovation and Entrepreneurship and in the Sociology PhD Programme. Co-coordinator of the Sociology PhD Programme and of the Post-graduation in Social Economy at FEUC. Has been involved in the main international association for the third sector/social enterprise, namely in the International Society for Third Sector Research and the EMES International Research Network. The research interests include the relationships between the state and the third sector, governance, partnerships and the third sector, complex systems theories, third sector and social economy organisations, innovation and social and solidarity entrepreneurship. Has been involved in research on social security reform, third sector and social policy, gender equality in third sector organisations, social entrepreneurship and social innovation, volunteering, local governance through state/third sector partnerships and social enterprises. The extension work focuses the relation between the university and society, particularly the social economy.